Since the Dawn of Designers, hobbyists around the globe have hungered for the next insane morph. They are always searching for the next “snowflake-galaxy-platinum-picasso-pink floyd ultra grade” design. 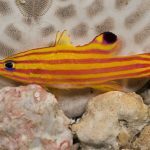 However for the last dozen years rarely have we seen any wild specimens with unique patterns. In fact, pre-2010, I don’t think we thought that it was a real possibility. That is until Lightning struck the world. 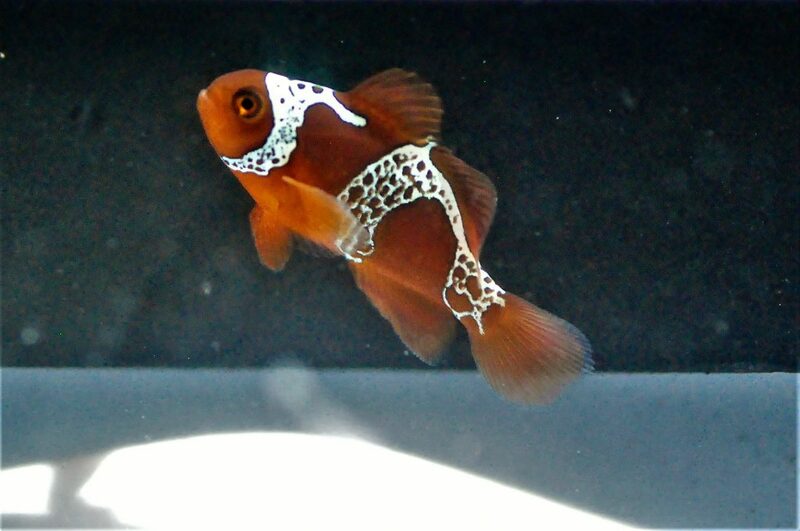 For anyone who might be unfamiliar with the origin of the Lightning Maroon clowns (Premnas biaculeatus), a brief summary is that an insane patterned clownfish was collected from Papua New Guinea in 2010. It was then sent to well known breeder Matt Pederson to be cultured. After some tribulations, he was finally able to produce the first batch of offspring. The industry was taken by storm and everybody wanted one. Unfortunately due to the price that they were settled at, only the committed could obtain them. That was until some commercial facilities bought F1s and have now released F2s to the public. Now with the upcoming release of ORA’s “Gold Lightning” some might ask what’s next for the Lightning Legacy? 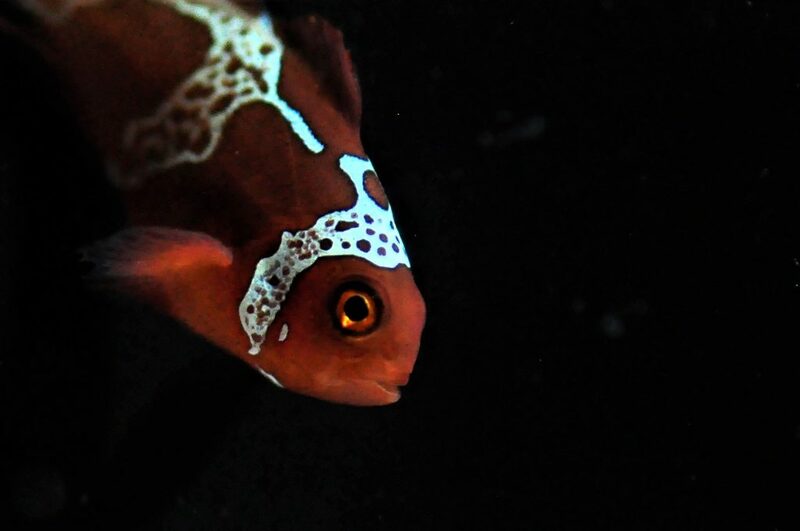 To read more about Matt’s work with the Lightning Maroon Clownfish please take the jump here. 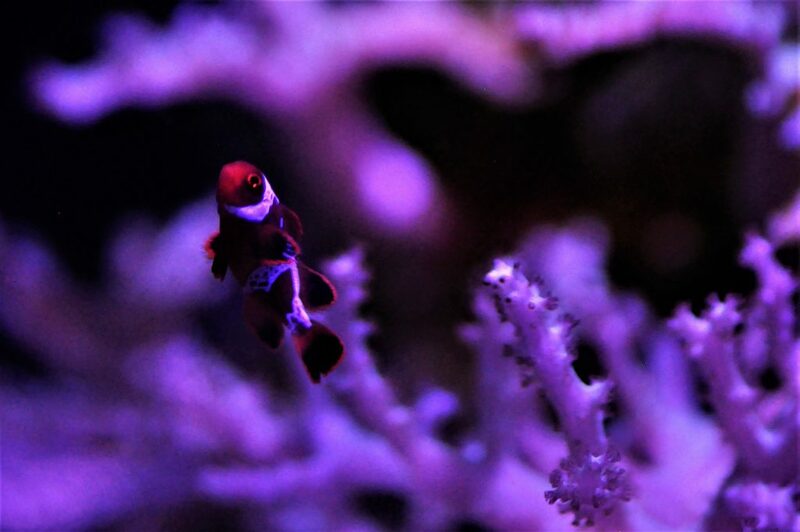 During my senior year of high school, attending the Central Campus Aquarium Science Program, I often daydreamed about Lightning Maroon clownfish. Having had a guest lecture from Matt himself that year had made me, like many others hope that some day I would be able to get a chance to work with them. It wasn’t too long for me. I joined up at the Long Island Aquarium in August of 2013. Not long after and thanks to a phenomenal partnership with Fluid Dynamics International I was able to obtain two of the first F1s to hit the market through Blue Zoo Aquatics. I was ecstatic. 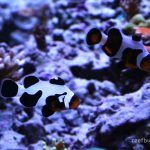 When they finally arrived at the aquarium I couldn’t believe it was real. From the moment I opened their box my obsession grew stronger. Now it was all too real. Not only did I have one of the first Lightning’s produced, but I was going to be breeding Lightning Maroons Since I obtained the F1’s at a relatively young age I knew that it would take some time to condition them into spawning. After a year of growing and maturing, I began to become frustrated because they would simply not procreate. Being approximately a year and a half they should’ve been more than ready to produce. So I decided to take them off my main broodstock system. 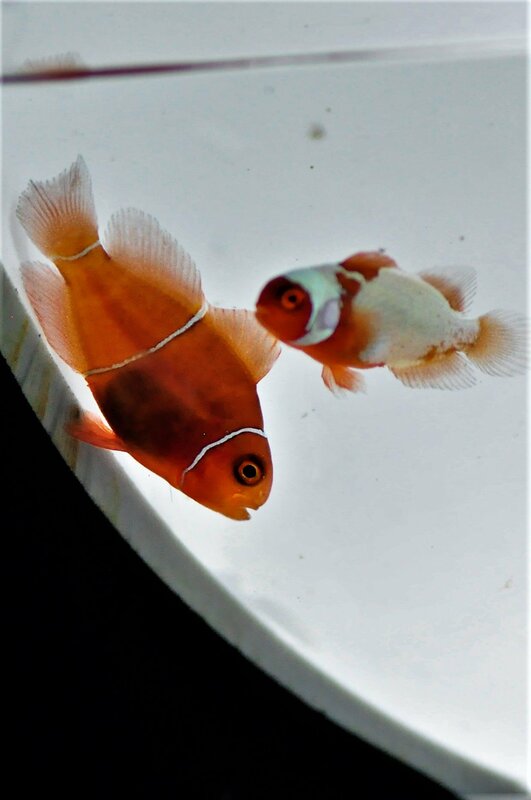 My theory was that having several other clownfish pair on the same system was prohibiting their sexual maturity. The hormones the other pairs were producing were preventing them from fully maturing and stunting their growth. So I moved them into a different system that contained no other clownfish. Finally after a month of conditioning, they started to spawn! Hooray! I had finally taken the next step towards success. However my newfound excitement was short lived. During the beginning stages of their sexual advances, I noticed after two or three days the female would eat the eggs. 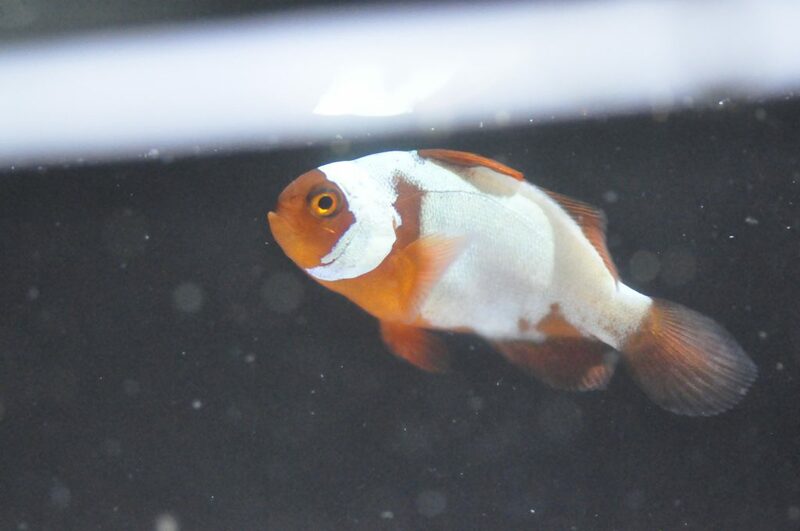 Fish have a natural instinct and they know when a clutch of eggs is bad and not worth the energy to take care of. Therefore they consume them to regain some of the energy that was used in spawning them. This is very common among newly spawning pairs. So I attributed this for the first few spawns. 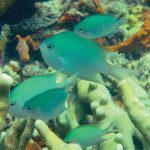 Most fish take a few tries to really get it down to a “science”. However after three bad spawns I decided that it was something more. The next thing I investigated was the possible lack of nutrition in their diet. 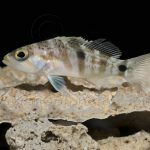 At the time the Lightning Maroon feeds consisted of: pellets a few times a day, mysis twice a day, and some frozen copepods once a day. I realized that this just wasn’t enough to really enrich their diet. This was around the time that Larry DuPont from Larry’s Reef Services had developed his new Fertility Frenzy. 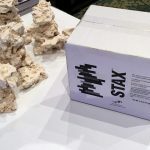 He sent me some of the prototype to be tested in my broodstock. Needless to say that my fish were hooked upon first bite. After just three weeks of introducing this to their diet they started to have really nice spawns! And they didn’t eat them. Without the induction of his food into their diets, I would not have gotten the spawn quality that I did. 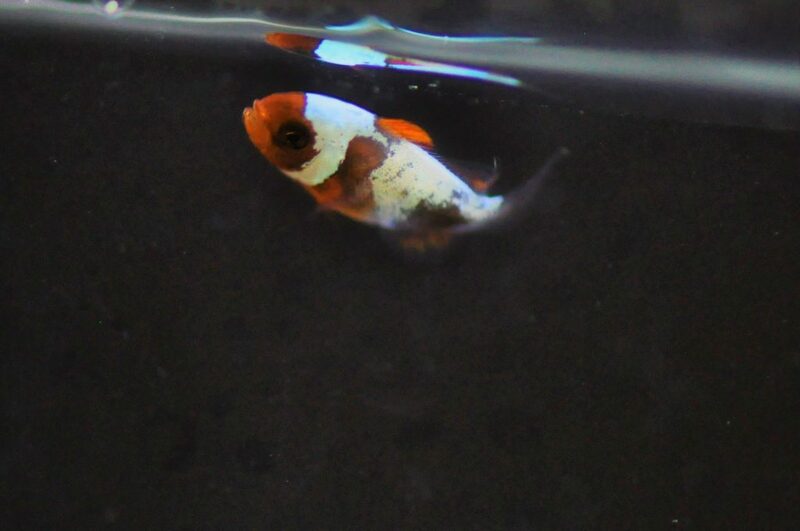 Now I exclusively feed his food to the pair along with some pellets and they spawn on a regular cycle. After the stress of conditioning the F1 Lightnings, it was smooth sailing from here on out. I had no issues rearing the larvae, mainly due to the fact that they got fed parvocalanus copepods several times a day until they were big enough to feed on rotifers and crushed pellet. Twelve days after hatching I saw the first stripe. I had finally done it. After years of dreaming and striving, I had finally settled my first Lightning Maroon. Soon followed by hundreds more. Now it was just a waiting game. What types of striping would I see? Would there be any new variations? What quantities would I see of the original pattern? Only time would tell. To help pass the time, I took to the web to see what kind of success Matt had with his F1 pairing. I saw multitudes of various grades. From standard Lightnings to some crazy misbaring. I was definitely hoping that I would at least get some of the patterns that he had produced. Low and behold, I got my wish. A large portion of the clowns that I have raised are the Ultra Grade Lightnings or “Thunder” clowns as I call them. They are a spectacle to the eye and appease every aspect of my expectations! 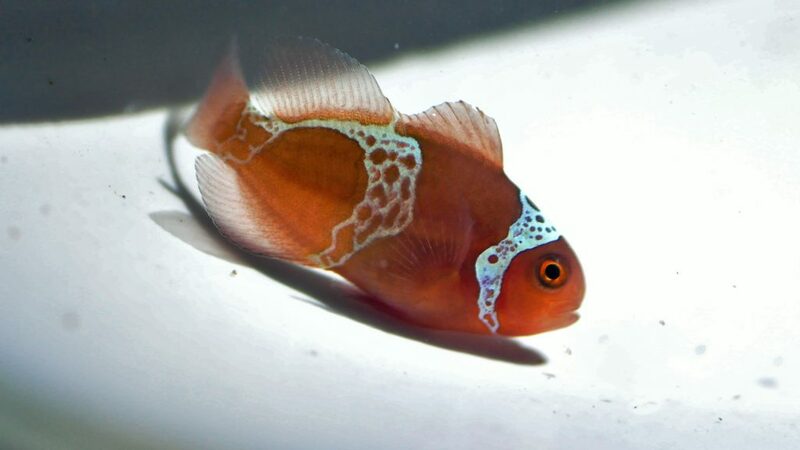 This unique batch of clowns has the most variation of morphs out of any other batch of clowns that I have raised. I have put them into 6 basic categories: Lightning Maroon Grade A: These are the cream of the crop! Most of the ones I raised ended up this way. Their Lightning webbing stretches farther than the standard lightning and each one has a unique head design as shown below. Lightning Maroon Grade B: Now even though I am calling these grade “B”, there really isn’t anything below average about them. These are what I would consider a regular Lightning Maroon by industry standards. Being F2s they align with the F2s being sold by some commercial facilities. 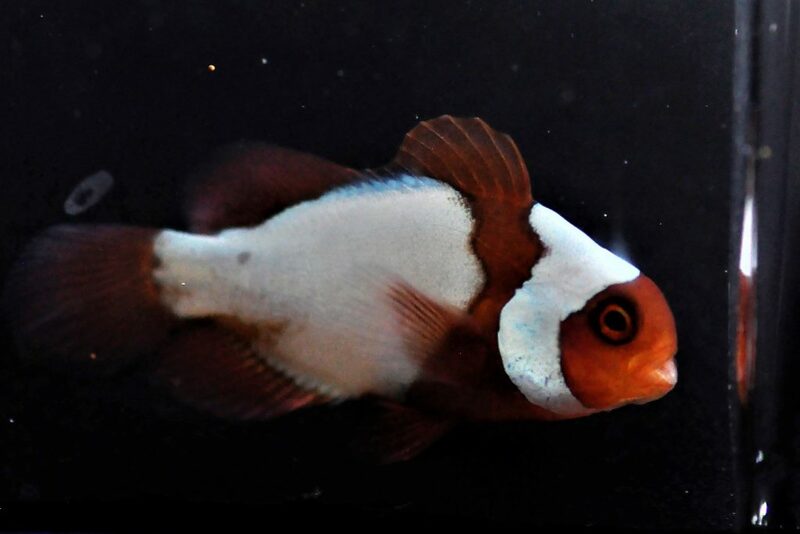 Thunder Maroon Grade A: Since these clowns are so different in design, almost like a platinum maroon, I decided that they deserved a suitable name. Lightning didn’t fit them since they do not have the “Lightning” pattern. So I thought to myself what comes after Lightning? THUNDER! These guys are so solid white it’s hard to imagine that they are still a maroon. 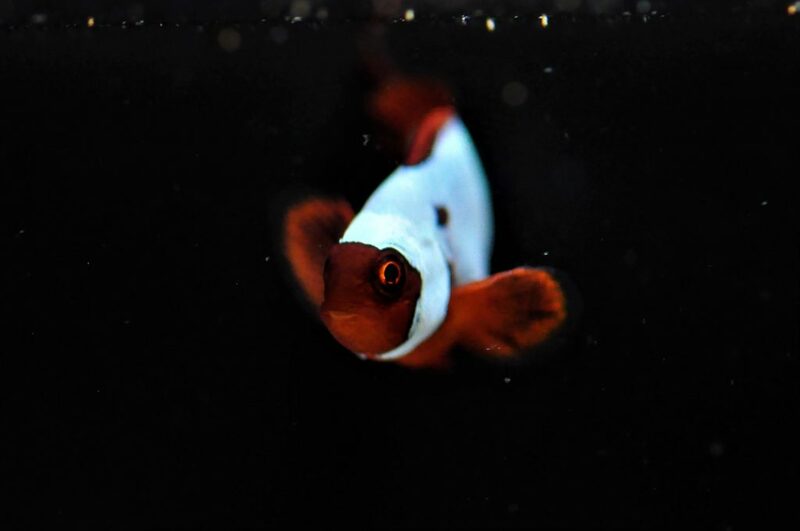 These have quickly become my favorite clownfish but I may be a bit bias! Thunder Maroon Grade B: Still stunning but not as solid in their striping. The white gives way to small patches of maroon here and there. Some may think these are even more unique than the A grade but they don’t hold the same stature in my heart. Blue Hue: Something I noticed in raising all of these Lightnings is that from the very first stripe to about 6 months, the barring of the whole batch has a very blue hue to it. After some time the blue seems to fade away and become a more natural white. 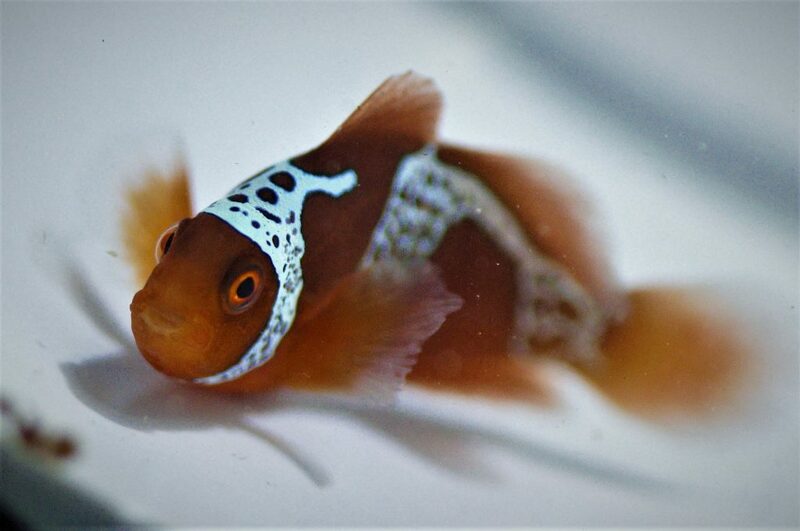 But there are a few clownfish in the clutch that have kept their color. Whether or not the blue is here to stay has yet to be determined. However if it does stay, they will be moved into broodstock to try and produce even more strongly blue colored offspring. Who knows – maybe some day we will have Blue Lightnings that have barring similar to A. chrysopterus. Whitestripe: Even the few standard Whitestripes that I raised ended up with dotting or misbaring. It seems like the Lightning Maroon genes won’t let anyone be standard. Every single clown has some sort of uniqueness to it. These variety of grades will soon be available through Fluid Dynamics. So keep your eyes and ears open! It has been a spectacular journey working with these clowns and I know it’s just the beginning. I cannot wait to see what the future holds for the Lightning legacy. I would like to thank Jared Goldenberg of Fluid Dynamics international for giving me the opportunity of a lifetime. Algagen – for always supplying me with new copepods when I need them. Todd Gardner – for always lending advice. Larry DuPont – for making the best food around. All of my coworkers at the Long Island Aquarium – for looking after exhibits and projects on my days off. Especially Katie Marino – who cultures the algae that feeds my projects and is my primary backup on all things larvae. And of course, the Long Island Aquarium, for letting me live my dream every day.